Recently, I conducted a training workshop for a company conducting systematic literature reviews. The group was young, energetic, hardworking. The biggest problem? Communicating with the clients. This is a field that is growing rapidly, and the buzz is getting louder. Clients want and need systematic literature reviews, and they want one that has every bell and whistle and covers every conceivable question. How to communicate to clients the importance of a focused approach, and the benefits of restricting a search? I began with an overview of the basics. 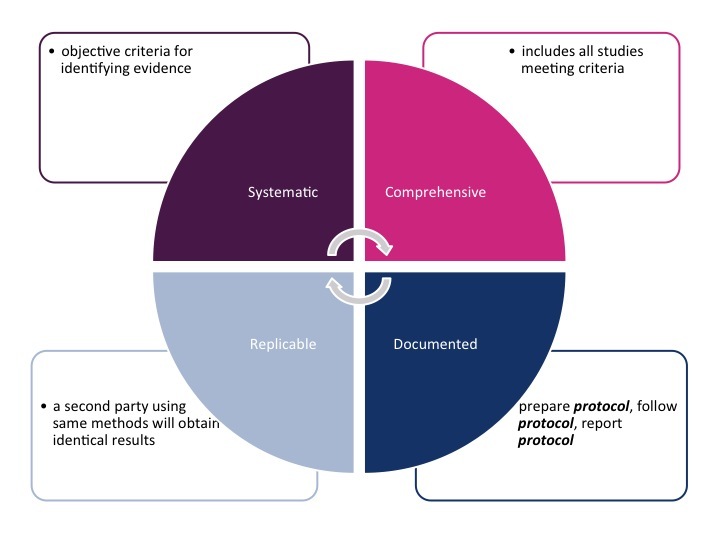 Systematic literature review is an organized method of locating, assembling, and evaluating a body of literature on a particular topic using a set of specific criteria. The systematic review may also include a quantitative pooling of data, called a meta-analysis. Younger professionals starting out may not know how “literature reviews” used to be done. I call it, “The Old Way of gathering information.” We used to go to our bookshelf, pull down a textbook, take the list of references to the library, and obtain and read references (remember standing in line for the photocopier?). Maybe we would search for references cited in first batch of references, and then we would write our “review”. Even then, we should have considered the problems. Text books are not current or comprehensive and the approach is highly variable; different people have different text books on their book shelves and will come up with different groups of references, resulting in variability in conclusions. As the volume ?of information increased over the past decades, the old approach became impractical and insufficient. These questions have relevance to guideline developers, clinicians, pharmaceutical companies, regulatory agencies, insurers, and others. This figure illustrates the key attributes of systematic literature reviews. Systematic literature reviews are: Systematic, Comprehensive, Replicable, and Documented. It looks simple, but it involves careful methodology and attention to detail. In addition to providing workshops and training in systematic literature review and meta-analysis, Dr. Lasky co-taught the student workshop on Systematic Literature Review and Meta-analysis in Pharmacoepidemiology at ICPE 2013.